I slept in on Sunday because I had stayed up late writing the post for Saturday’s game. I watched some of the Olympics and awaited a call from the reporter who asked for a number to reach me at. I really didn’t have any plans on Sunday but I kind of put off deciding on what I was going to do before the game because I wanted to be available to do an interview, whenever and wherever it may have been. Long story short no one ever called and the guy who I gave my number to never returned my subsequent messages or tweets as to why that was the case. Very frustrating. Anne and Mike, my aunt and uncle who hosted me for the weekend, treated me to a late lunch at Patrick’s Restaurant and Sports Bar. It opened as a restaurant by the same name, then was changed to “Pujols 5” in 2006. Pujols agreed to a deal where he would a get a percentage of the sales in exchange for him making appearances and allowing them to use his name. They erected a statue of Pujols in November of 2011 outside of the restaurant, but we didn’t see it. 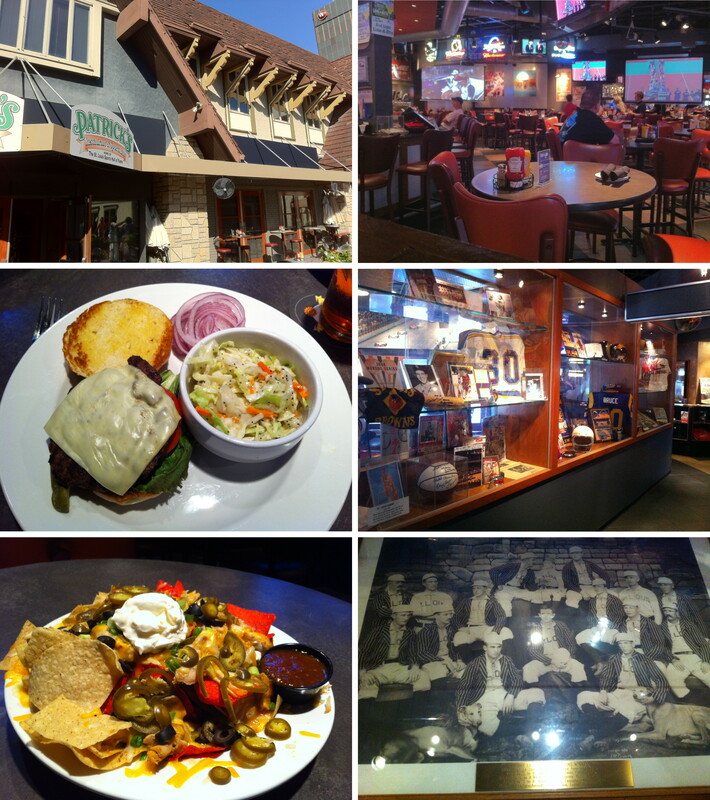 When he left they changed the name to St. Louis Sports Hall of Fame Bar and Grill. That only lasted a few months and they returned to Patrick’s Restaurant and Sports Bar. 1) The exterior of Patrick’s. I should have backed up a ways to get the fountain in the picture but I failed to do so. 2) One of the seating areas, there are quite a few TVs and most had the Olympics on when we were there. One was showing women’s volleyball and another was showing women’s beach volleyball. It was a good lunch. I think the sport is exciting, come on people. 3) Some of the sports memorabilia that they have in the “Hall of Fame” at the restaurant. 4) One of the pieces was a picture of the 1880s St. Louis Brown Stockings, who became the Cardinals in 1900. The picture had a caption that read “The first four-time champions” or something like that. I checked Wikipedia and the Brown Stockings won four consecutive American Association pennants (1885 – 1888). I took a picture of it because there are two dogs posing with the players. Oh the 1880s. 5) Our appetizer, which had a very long ingredient list on the menu: “Crispy Fried Tortilla Chips Layered with Chipotle Spiced Chicken, Green Onions, Jalapeños, Black Olives, Pico de Gallo, Cheddar and Jack Cheeses, and Roasted Corn Salsa, Served Over a Bed of Chorizo Black Beans with a Side of Sour Cream and Housemade Fire Roasted Tomato Salsa.” Whew. They were good. 6) My lunch was a bison burger with pepper jack cheese and a side of cole slaw. I asked for onions because it didn’t come with them and they supplied enough for three burgers. It was good but nothing to write home about (even though I’m doing just that, in a way). 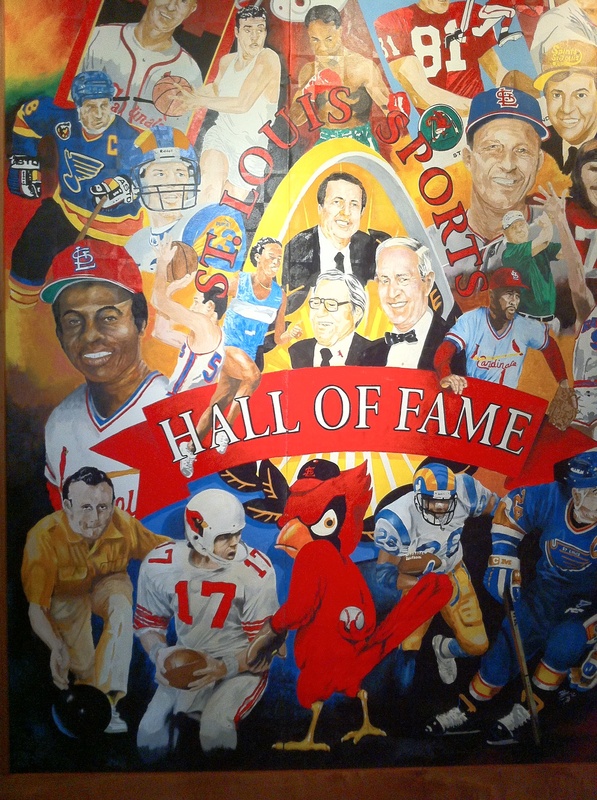 One last picture, they have a mural to commemorate prominent athletes and announcers that played/worked in St. Louis over the years. We left just after five and I headed to the game. I was parked at 5:35 and walked to Busch Stadium, but this time I took a route where I could make sure that the on ramp to the Interstate I’d be taking after the game was open. On Saturday Google Maps on my phone supplied a route that included an on ramp that was closed. I wasn’t going to allow that to happen again so I verified the on ramp to I-64 East on 6th street was open, it was. 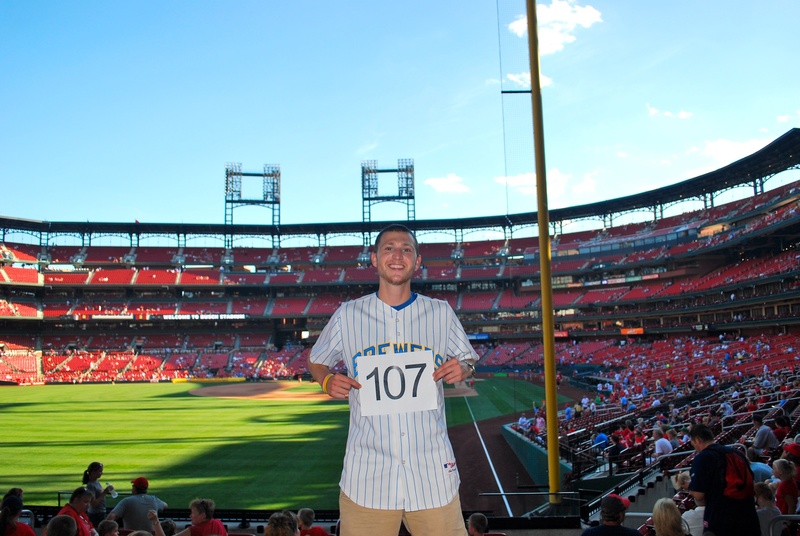 After I was inside the stadium I went to the left field corner to get game photo number 107 taken. When I was looking for a good spot a Brewers fan stopped me and said “Hi Ben.” I felt bad because I had no idea who he was but luckily he said he reads the blog and I wouldn’t know who he was. I’m bad with names so it was very possible that I had met him before. His name is Matt and he lives in Milwaukee. His wife and kids were with him and they were visiting some friends in St. Louis over the weekend. Matt offered to take the picture for me and it worked out well. It’s always best when I can get a Brewers fan to take it because I feel like they’ll be less bothered when I ask for a (couple) retake(s). I had plenty of time before the game so I went around to the ESPN camera guys, briefly told them what I was doing, and politely asked if they could talk to their producer about maybe getting me an interview. The first guy said he’d mention it but I’m not sure that ever happened. The second guy took the card but was very honest and said that ESPN has a strict game schedule and that there was nothing he could do. He could’ve at least asked, right? The third camera guy kind of laughed at me and then mouthed “talk to me after the game.” That’s not going to help. I had also tweeted at a bunch of ESPN baseball analysts hoping that one of them might reach out. Some of my followers retweeted my tweets and tweeted directly at them urging them to read my story and have me on. I’m sure they get requests to help out other causes all the time so they really can’t do stuff like that. I just thought that with the baseball connection it might make for an interesting storyline. 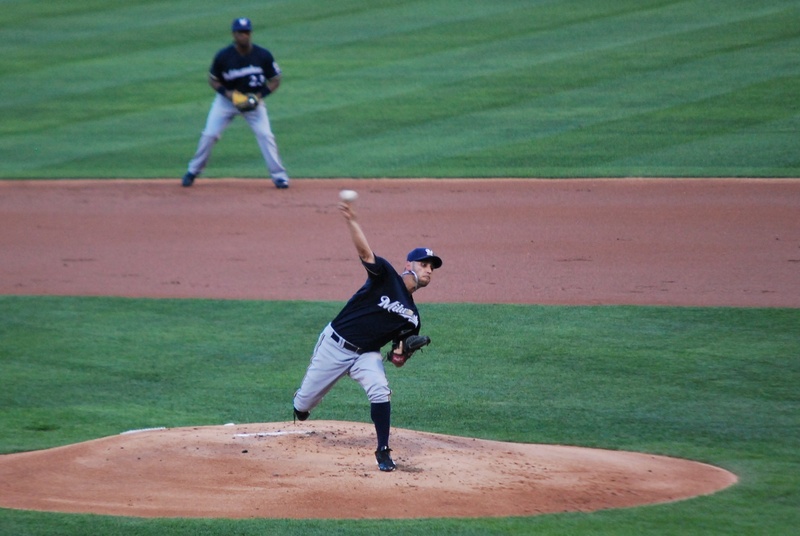 The game got underway at 7:05 and Cardinals starter Kyle Lohse delivered a strike to Norichika Aoki. The ball is crossing home plate (if you were looking for it). 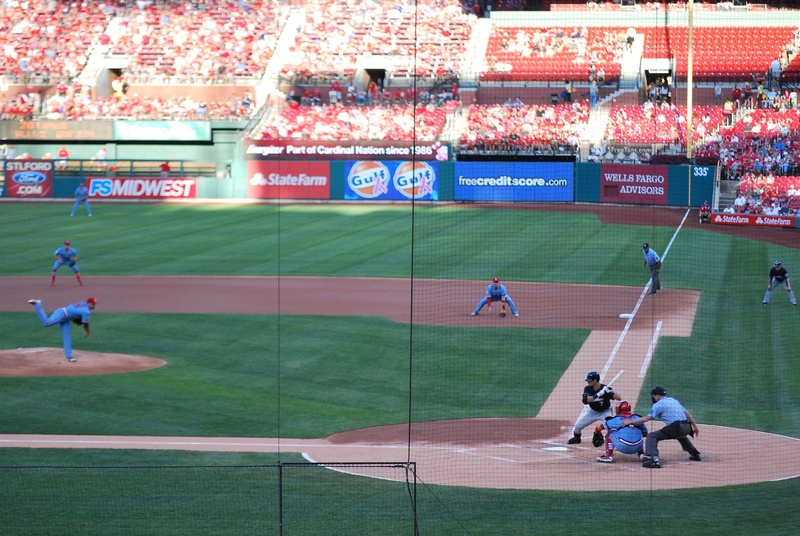 The Cardinals were wearing their powder blue throwbacks from the 1982 season, the year they beat the Brewers in the World Series. They celebrated the anniversary all weekend long and while I wasn’t alive when it happened, it still wasn’t fun. 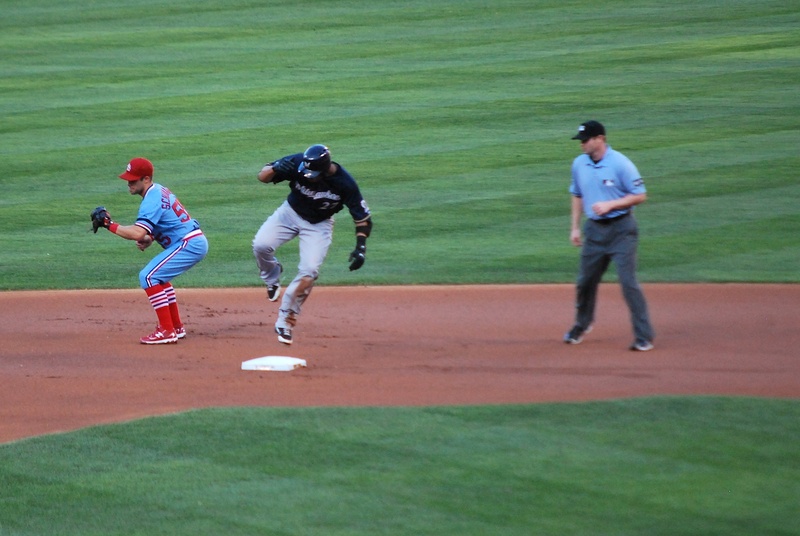 Gomez doubled after Aoki lined out and he slid into 2nd base, popping up after arriving safely. I was actually trying to get a picture of him in his slide but my zoom lens isn’t focusing properly and it was very delayed. I’m pretty happy with the result though. The only problem with the slide is that if the throw had gotten there a little earlier Gomez would’ve been out because he was off the base. Estrada gave up the run in the second inning and the Cardinals tacked on solo runs in the 7th and 8th innings, and won in shutout fashion. Final Score: Cardinals 3 – Brewers 0. In the 8th inning I left my seat and went to a standing room location near an exit for the last 6 outs. A Cardinals fan stopped to chat (and admitted later he did so to give me a hard time). After he found out what I was doing he was blown away. His name is Nathan and he’s a really nice guy. I had said I was going to all 162 but I’m pretty sure he thought I meant I was going to all the stadiums. After he realized I meant all 162 Brewers games and that I’ve been following them around the entire season he dropped a few expletives and congratulated me. He insisted that there had to be a way to help me out personally, but I said there wasn’t. I told him that I had places to stay and was a little under budget so far. I told him to spread the word about Be The Match and encouraged him to make a donation to the cause or join the registry. Back to baseball: the loss completed the first sweep of the Brewers at the hands of the Cardinals at the current Busch Stadium. The road losing streak has now reached nine games. They haven’t won a road game since July 8th, the final game in Houston before the All-Star break. Scoring a total of four runs in a three game series will not result in many wins unless you have an amazing pitching staff, and sadly that’s not the case. They were outscored 18-4 overall; ouch. Ten minutes passed between the final pitch of the game and me being on I-64 East. Nice! I stopped in Janesville to get gas on my way back home but I still able to make the 335 mile drive in 4 hours and 57 minutes. I got in at 3:03 AM but for some reason wasn’t tired. I fell asleep at 5 and got up at 11. It’s 1:40 now and I’ll be leaving in a few hours for the first game of the three game series vs. the Reds at Miller Park.